This edited article about the French Revolution originally appeared in Look and Learn issue number 826 published on 12 November 1977. Among the many victims of the French Revolution was Marie Roland – a young woman who was sent to the guillotine for the part she played in a struggle for power. Just before she was executed in Paris on 8th November, 1793, Madame Marie Jeanne Roland declared: “Oh, Liberty what crimes are committed in thy name!” For these few words which so exactly summed up the darker side of the French Revolution, she has been lastingly remembered. Marie Jeanne Roland was born in Paris on 18th March, 1754. When she grew up she came to believe passionately in liberty and the idea of founding a new and just State in France. In 1780, she married a government official who shared her views, and together they worked for a revolution which would bring equality to all. To this end they became leaders in the Girondist movement. 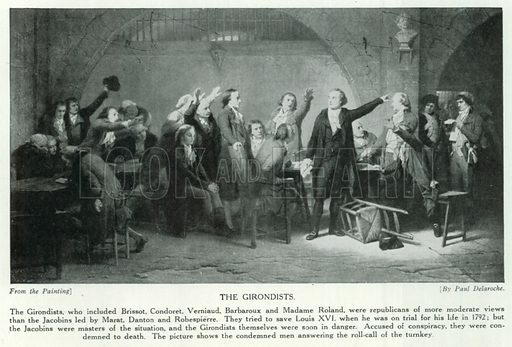 The Girondists – so-called because many of their members were from the Gironde district of Bordeaux – were opposed to the revolutionary leader Marat. A struggle for power ensued, which Marat won in May, 1793. There followed a Reign of Terror in which the Girondists were persecuted. Among the victims was Marie Roland. She was taken to the guillotine, where she met her end with great bravery.